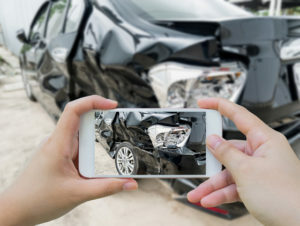 The aftermath of an automobile collision frequently leaves you dealing with insurance companies and often attorneys if legal action is undertaken. Your successful outcome may depend on what and how much information you gather at the scene. Always first render aid, call 911 and ensure you are safe from danger presented by traffic at the collision site. You should then focus on gathering good information. 1. Do not admit liability – Even if you think you are at fault. Circumstances could have contributed to the accident that you are not aware of. Let the police and your insurance company determine fault. 2. Get driver information for all drivers – Even if a police report is filed. Copy down name, address, phone number, driver’s license number, insurance company and policy numbers. 3. Get passengers information – Names, addresses, phone numbers. 4. Write down witness information – Copy names, addresses and phone numbers of all witnesses. 5. Vehicle information – Make, model year and license plate information of all involved vehicles. 6. Collision location – Write down the address or intersection of the collision and make note of time of day and weather and lighting conditions. 7. Take photos – Almost everyone carries a smartphone. Snap photos of license plates, damage to all involved vehicles and take a few shots of the collision scene. A great way to record driver’s license and insurance information is to photograph the documents. 8. Police information – If police respond to the scene, write down the name of the responding agency, incident report number and officer’s name and badge number. 9. Call your insurance company to file a claim – They will use the information you have gathered and start the claim process. 10. Retain an attorney – Many collisions are not easily settled and result in legal action by involved parties. Do not hesitate to retain legal counsel if you are not treated fairly by an insurance company or if other parties take legal action. It is always a good practice to consult your attorney. Preparation is key to a successful outcome in any crisis situation. Make sure you have a notepad and pen in every car you drive, travel with your smartphone, and keep these tips in your car with your automobile registration and insurance documents.